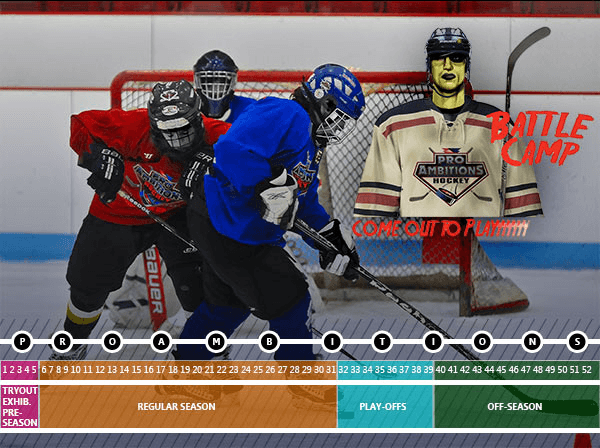 Periodized Training - Pro Ambitions Hockey, Inc. I believe in periodized training for hockey players. Periodized athletic training goes back as far as the ancient Olympic games. The metrics for this type of training are actually quite simple and make a lot of sense. It is the manipulation of training volume and intensity with short unloading phases in order for the athlete to reach peak condition at the appropriate time. The goal is to minimize injury and risk of overtraining. The hockey player’s year is divided up into distinct phases called mesocycles when discussing periodized athletic training. The mesocycles for hockey players are pre season/tryouts, season, playoffs, post season rest, and summer training. I have written articles about what I call â€œ the summer hockey growth spurt.â€ For me personally, summer was the most important mesocycle in my Periodized hockey training. I am reflecting on my prep school through pro hockey career. What hockey players do over the summer makes all the difference in how their performance will be in their upcoming season. Hockey like many sports places emphasis and importance on performance during an entire season. The hockey season is long. Longer than any other sports. Peak condition needs to be achieved by the onset of the competitive year and maintained throughout the long competitive hockey season. Studies have shown that the summer mesocycle in periodized hockey training is the most important mesocyle in achieving peak performance prior to training camp or try outs in order to have a growth and improved level of play during hockey season. In season training is typically called the maintenance mesocylce where a reduced frequency of training is necessary. Focus is on execution. Back to the summer hockey growth spurt…the summer mesocycle is the key to a hockey player’s growth in the game. This is the time to train wisely and efficiently with experts.